Zelda, and eight-year-old Arabian, had a beautiful coat when Barbara acquired the mare late in the fall. However, as summer arrived and temperatures began to rise, Zelda broke out in hives. The poor horse itched so badly she rubbed herself raw. Barbara suspected Zelda’s skin problems were due to allergies but when she phoned her local practitioner about getting help, she could almost hear him cringing on the other end of the line. “I knew then that I had my work cut out for me,” she said. While more horses than ever before suffer from allergies, there is no one shot cure that takes care of the problem. Each case is so individual and what works on one horse may have no benefit to the next. As you consider the information I have to offer here, please remember that if one approach does not work for you, do not give up on your horse. Allergies and skin conditions are multi-layered and, although it may appear your approach is not working sometimes, your horse’s body may just be peeling away at an invisible layer, enabling your next level of treatment to be more effective. An allergen can include pollen, dust, feathers, drugs, insect bites and feedstuffs, so your first priority is to eliminate what you suspect may be causing your horse’s allergy. If the allergens cannot be avoided, your veterinarian may suggest antihistamines or corticosteroids. These can provide temporary relief, but in the long term you do need to address your horse’s immune and elimination systems. Natural therapies can help you with this process. Your horse’s first line of defence is the liver, so any protocol should include supporting this gland. If you believe there is a toxicity or poison present in the body, you’ll want to help the liver detoxify using my two favorite herbs, milk thistle (Silybum marianum) and rosemary (Rosmarinus officinalis)*. Milk thistle seed helps cleanse the liver, assists with the regeneration of liver cells and protects these cells against the action of liver poisons. Add rosemary in the next phase of treatment as it is a complete herbal antioxidant, a secondary liver cleanser and also hepatoprotective. The powdered forms of these herbs are commonly used. From a naturopathic perspective, most skin issues reflect an inhibition or dysfunction of one of the other major elimination organs. Look at the liver first, but also consider the kidneys, digestive system and respiratory tract. If there are breathing difficulties or the presence of catarrh, your horse could benefit from supporting his immune system. My preferred species is Echinacea angustifolia in either its powdered root or liquid extract form. I find I can give these forms long term effectively, whereas the dried leaf does not seem to maintain its potency or efficacy as well and is better suited to short term use. As your horse’s body begins to detoxify with the liver herbs, Echinacea can fight off secondary infections and help your horse rebuild her immune defences to the allergens. In addition, since Echinacea is traditionally used as a blood cleanser and purifier, it supports the milk thistle and rosemary. These three really make a great team. *Rosemary should not be given to pregnant mares. Any issues with the lungs lead us to the digestive system. If your horse has a runny nose or gluggy ears in response to the allergens, it could indicate an internal reaction to feedstuffs. My favourite herb to address this with is marshmallow root (Althaea officinalis) and I prefer the powdered herb in this situation. In severe cases, paste your horse with one or two tablespoons of herb mixed with water before feeding (use a syringe) or, in milder cases, simply mix it into a wet feed. By addressing the gut in this way, you will soothe the mucosal layer of the digestive tract, which in turn will alleviate the clinical symptoms – the dry and pruritic skin conditions. Could it be his kidneys? If your horse’s urine is irregular, his sweat patterns vary, or your horse has sensitive ears, you may find his allergic conditions respond well to flushing the kidneys. A gentle yet very potent approach to this is adding some freshly picked parsley (Petroselinum crispum) – a nice handful each day – to his feed for about a month. You can use the dried leaf as well; in this case usually one or two heaped tablespoons are sufficient. Parsley also calms the nervous system and serves as a carminative (relieves gas) and digestive tonic, supporting the use of marshmallow root. You may observe as I work through the body’s elimination processes, that the herbs I select overlap in their functions across each of these body systems. So, as you assist your horse through the various stages of his “line of cure”, your emphasis may shift between any of these systems. You can vary and substitute herbs to further individualize your approach; any bitters including burdock or dandelion root will replace my liver suggestions; immune support such as astragalus or olive leaf could continue on from Echinacea; slippery elm or plantain could address the gut, and mullein or elecampane may help the respiratory tract. Dandelion leaf serves as an easy substitute for parsley. If your horse has suffered from a chronic allergy condition, you may also need to address the nervous system. Allergies can really wear on the soul, and after a while most horses become agitated and short-tempered by the constant physical irritation. Again, parsley may assist here as it can be very calming to several body systems. You could also use any of the calming herbs such as sweet flag, lemon balm or chamomile for the same purpose. Topically, you have a wide selection of herbs and essential oils to choose from. I usually recommend calendula (Calendula officinalis), sometimes known as pot marigold, which is an effective local tissue healer when applied in a cream, balm or infused oil to itchy skin. You can also administer it internally to help the body’s inflammatory response come back into balance. Other herbs include aloe vera gel and a rinse made from chamomile flowers. Tea tree (Melaleuca alternifolia) is antipruritic (anti itch), and when applied to a very small section ‘neat’ or diluted into a carrier such as aloe vera gel, this essential oil will take the itch out of most skin irritations. It is safely combined with lavender (Lavendula officinalis) which is cytophylactic (able to stimulate new cells) so the skin repairs quickly. Manuka (Leptospermum scoparlum), another essential oil very effective in healing the skin, has anti fungal and anti bacterial properties and works well with the other two essential oils. Once your horse’s body has begun the process of elimination, you can take the next step by supporting her nutritionally. Rosehips (Rosa canina), an inexpensive additive to any feed, is high in flavonoids which nourish the skin and assists our previous herbs with addressing mild infections and soothing gastric inflammation. Clivers or cleavers (Galium aparine) contains high amounts of silica to support the skin, and is a very effective lymphatic cleanser and remedy for skin eruptions, especially where associated with tissue oedema. We often think of massage when we talk about aromatherapy, but essential oils can help with allergies and skin problems too. If you are having difficulty in deciding what approach to take with your horse, offer her a selection of essential oils to give you some insights as to where to start your protocol. At the same time, this approach will stimulate and tune up her endocrine system to help rebalance some of the issues that may be underlying the allergic conditions. My first essential oil of choice is carrot seed (Daucus carota). The scent is an immune stimulator and can indicate if your horse’s digestive system needs addressing. If she shows an intense interest in the scent, your horse can safely lick this one from your hand. This can have a catalytic affect throughout the body to help trigger the liver into action. 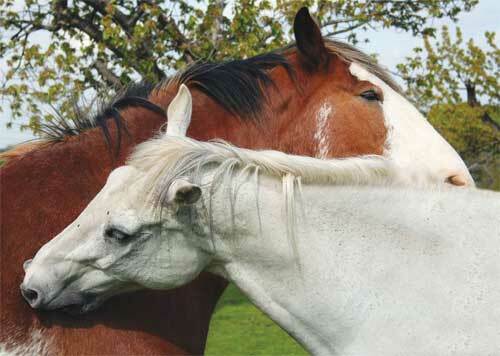 A horse that goes for this scent may have sluggish digestion, be burdened with worms or need support from liver herbs. This essential oil’s action is so strong, that I check too see if the horse is still attracted to the scent 24 hours later. Often the initial scent and taste will be enough for the body to adjust and restore its own homeostasis. It’s possible that irritating issues in your own life may be contributing energetically to your horse’s condition. Clearing these emotions will most certainly help you but may also help your horse to heal. To this end, I like to include simple flower essences such as the Bach flower essence, Crabapple. To support this approach, I also include the use of biochemic tissue salts. Kali Sulph (Potassium Sulphate) is a skin nutrient, and is well supported by Silica. If there is a nervous component I may include Kali Phos (Potassium Phosphate), or if my focus herbally is that of cleansing the body, Calc Sulph (Calcium Sulphate). There are 12 tissue salts in this therapy that follow basic homeopathic principles and each may be employed at various stages throughout dealing with allergies and skin issues. An experienced homeopath could certainly guide you here. As Barbara discovered when she started working with Zelda, addressing allergies and skin conditions takes a personal approach. Depending on your horse’s condition, it can be simple or be multi-layered. When it’s multi-layered, the key to your success is patience and a keen observance so you know when the next layer of the issue is available for healing. Hopefully, I’ve provided some direction to follow if your horse is unfortunate enough to be inflicted with allergies or skin conditions. HINT: Another indicator that your horse’s stomach may need assistance is if the flies aggregate around his eyes. In Chinese medicine, the eyes are closely linked to the stomach. HINT: Add carrot seed essential oil to your calendula cream to give it that little extra range of healing. If I suspect the horse needs further detoxification, I will offer her the scent of juniperberry (Juniperus communis). Juniper will indicate the need to cleanse; it supports the elimination of any toxic build-up and indicates if the horse needs assistance with liver herbs.